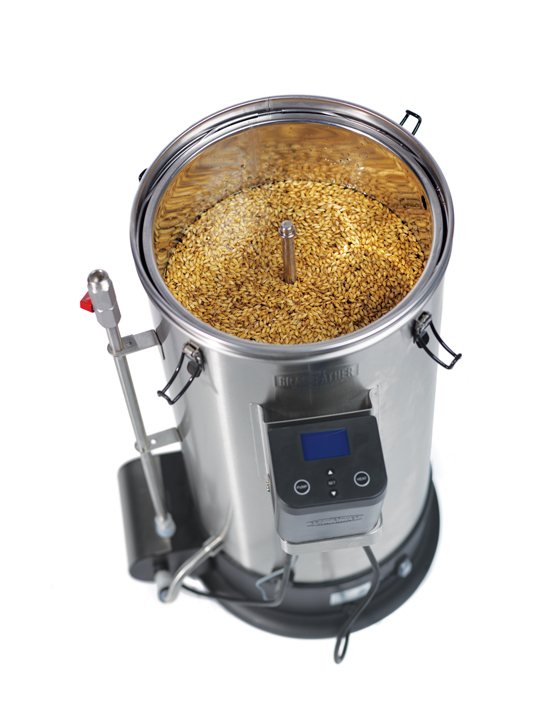 ALL Grain Recipe Kits are designed to make great beers with your Grainfather. 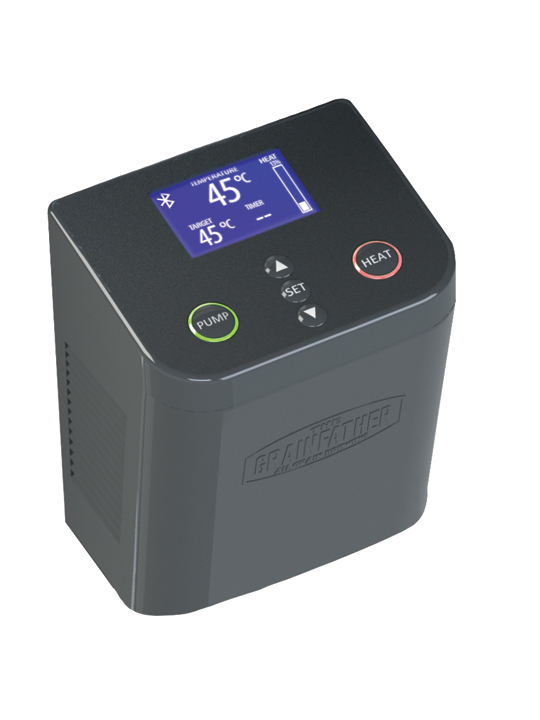 The Grainfather Connect with blue tooth connected control box, is your all in one grain brewing system for both experienced and beginner grain brewers. 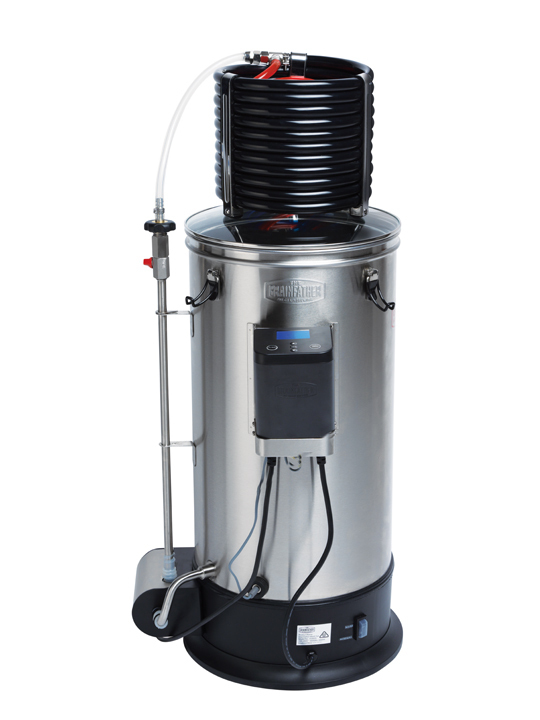 It is a 30 L capacity unit made from quality 304 grade stainless steel, designed to make up to 23 L of beer from one brew. Undoubtedly the best All-Grain unit of its kind. 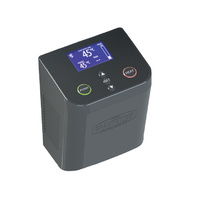 The Grainfather Connect Control Box provides automation without removing the fun of brewing. You can be as involved as you want to be! More automation means you can multi-task or simply relax while brewing and then be alerted when to return for your next step. 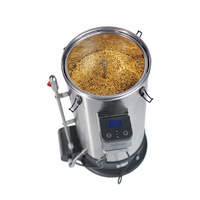 The Grainfather is electrically powered and features a dual element (both 500 watt & 2000 watt) to vary power and heat output so you can mash with lower heat and quickly bring it to boil during the different stages of the brewing the brewing process. The Grainfather is known for precision temperature control for the best possible results. A gentler heat is used at certain stages to minimise the risk of scorching and after the mash it can also ramp up the heat quickly for when more vigorous heating is required. The Grainfather cleverly switches between the two as necessary. Heating from mash to boil takes approximately 20 minutes. Use the Connect Control Box in conjunction with the Connect App to connect to the Grainfather Recipe Creator and the Grainfather Brewing Community. . 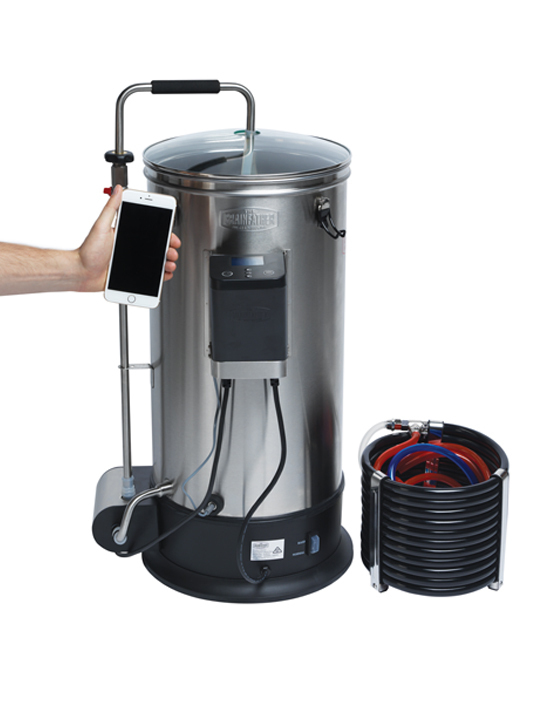 Create your recipes on the Grainfather Brewing Community and then sync these recipes with the Connect app The control box has Bluetooth connection to your mobile device so it can be controlled remotely. 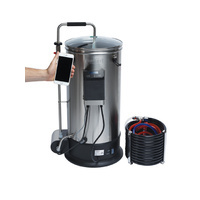 This allows you to do other activities or tasks while brewing and then be alerted when to return to your next step. Also the pump is used during the cooling stage to pump hot wort through the wort chiller for efficient cooling of the mash. Also used to clean all pipe work by pumping the cleaning detergent through the system. A Grainfather pump filter is fitted inside the Grainfather to prevent hops and stray grain from entering the pump or pipework, keeping the wort clear while also preventing any blockages. 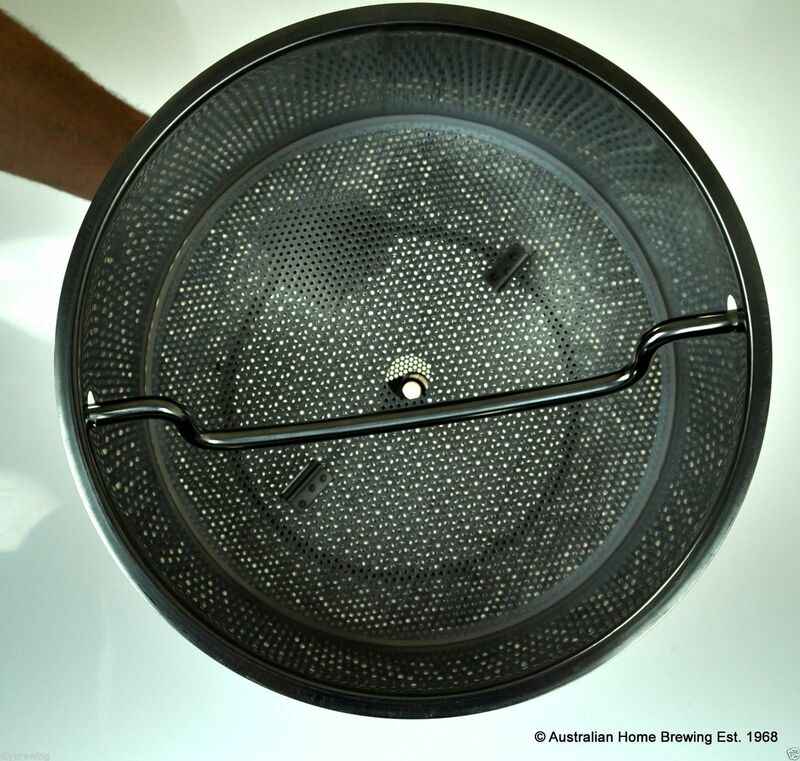 A stainless steel variable height grain basket allows you to brew with anything from 4.5 – 9 kg of grain. Featuring perforated plates and telescopic pipework to expand or decrease the size of the grain basket to the size of your grain bil. 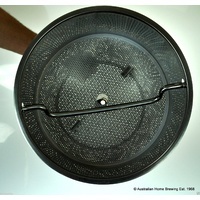 When ready for sparging, a basket lifting handle is then inserted into the grain basket to lift it up, out of the wort. A 45 degree turn then allows the grain basket’s feet to rest on the specially designed support ring to allow the grain basket to drain while you can batch sparge over the top. 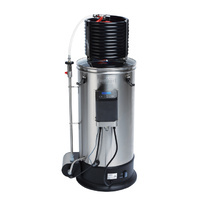 A Sparge Water Heater can be purchased additionally to heat your water to the specific temperature required. A counter flow wort chiller has two connection points. One side is connected to the Grainfather, while the other is connected to the cold tap water. 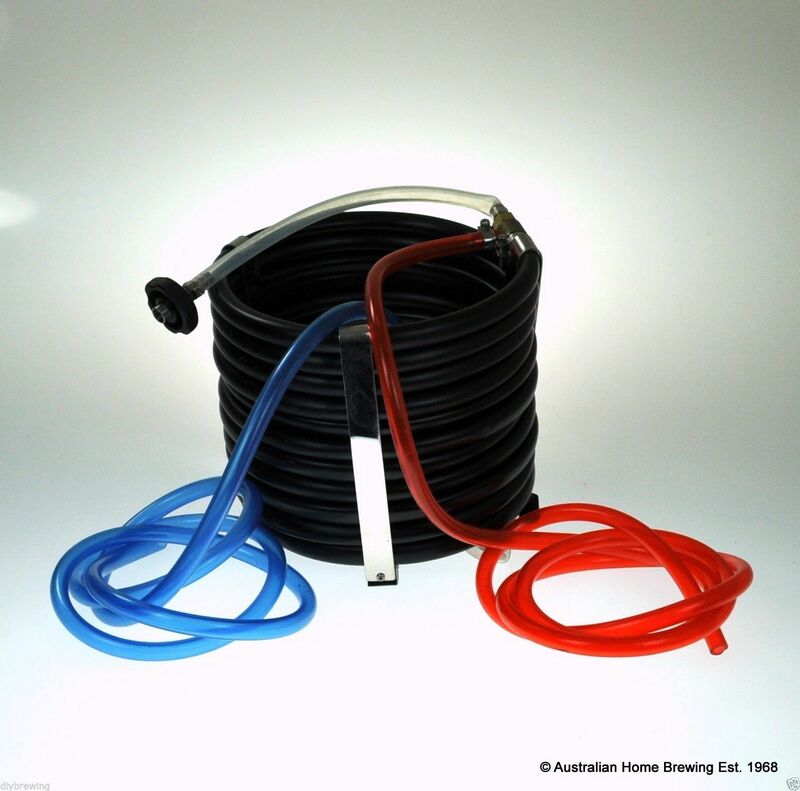 The hot wort is then pumped through copper inner coil while the cold water flows through the outer coil in the opposite direction, providing instant cooling and heat exchange. Once cooled the fresh wort can then be pumped directly into your clean, sterile fermenter. 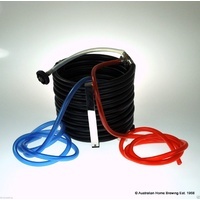 This reduces the chance of contamination as nothing is inserted in the wort, and it is only passing through the wort chiller once , going straight to the sterile fermenter where the yeast is added. A full batch of hot wort can be cooled in as little as 20 minutes. The cooled wort temperature will be cooled to approximately 5 degrees above whatever your tap water temperature is. The Grainfather is fully supported by us at AHB and by a fantastic Grainfather support team who love brewing just as much as you do. Our support team is here for any technical enquiries on brewing or how the Grainfather works, as well as general customer service enquiries. All Grainfathers come with a 36 month warranty.